Dental emergency. These are two words you (hopefully) don’t hear together very often, but it’s a situation that many people experience every day around the country. If you sustain a dental injury, it’s important to know if it requires immediate attention or not so you can take care of your teeth and avoid unnecessary trips to the dentist. 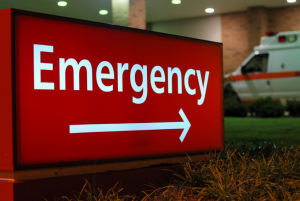 Today, we’re going to discuss which oral injuries require emergency treatment and what you should do if you experience one. The most common kinds of dental emergencies deal with teeth being cracked, broken, or completely knocked out. This usually happens as the result of biting into a hard piece of food, a sports injury, or some other type of accident. If your tooth only sustains a small chip, while you’ll still need dental treatment, there is no need to rush to your dentist in a panic. You can simply wait to call them during their regular business hours. However, if your tooth has actually cracked and a large piece of it is missing, this could mean the sensitive nerve has been damaged. At this point, you should seek out dental care as quickly as possible. Try to recover the pieces of your tooth if you can, and use a cold compress on your face to manage any pain or swelling. If your tooth has been knocked out, you should definitely contact your dentist as soon as you can. Find your tooth, handle it as little as possible (taking care to only touch the crown), and see if you can place it back into the socket. If you can’t, put it in a container of milk or saltwater. It’s important that the tooth stay wet until you can see your dentist—this will keep it viable for reattachment. You can take an over-the-counter medicine to lessen any pain you might be experiencing. Of course, there are some dental emergencies that aren’t as obvious as a knocked out or broken tooth, such as the case with a severe toothache. Dental pain can have many causes, ranging from minor to serious, so in any case, you should contact your dentist right away and let them know. They’ll advise you on whether you should come in immediately or not. All in all, if you ever have a problem with your teeth, be it an emergency or otherwise, it’s always a good idea to call your dentist. They’ll be able to tell you whether or not you have a dental emergency and if it requires urgent care. Even if you know their office is closed, it’s still a good idea to call because they may have an emergency number or prerecorded instructions on what you should do next. If you can’t reach anyone and need care fast, you should head straight to your local emergency room, but this should only be used as a last resort. Dr. Masha Kogan is a general, cosmetic, and emergency dentist based in Westport, CT. She currently practices at The Dental Center of Westport and has years of experience treating dental emergencies. If you’d like to learn more about everything you’ve just read, she can be reached via her website or by phone at (203) 227-8700. Comments Off on Do You Have a Dental Emergency?